I'm pretty sure I own a copy of American Breweries II. Not sure exactly where it is, but it must be on one of my bookshelves. It's probably also worth looking at the economic cycle to see how that fits in with brewery openings and closures. A graph of British breweries would show a similar decline after 1880. The decline in the latter decades of the 19th century, when the population and beer consumption were both still increasing, can be mostly accounted for by an expansion in scale at the larger end of the industry and the squeezing out or buying up of smaller concerns. It's not so much the the decline itself. I would expect that. Like any industry beer, has its ups and down. What I think is more important are the spikes in Buffalo, and especially Rochester. What was happening out there? I don’t think that there was an “unsustainable beer bubble” so much as there were business realities that affected different parts of the state in different ways. Looking at the number of breweries to determine the “height of brewing” is one approach, but understanding your graph requires looking at brewery production and not number of breweries. 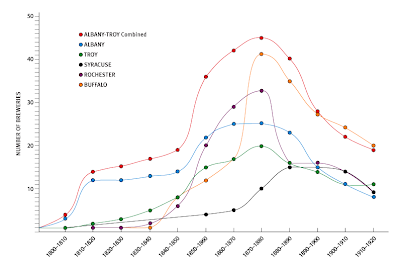 Percentage-wise, Buffalo and Rochester both had larger drops in brewery numbers than Albany and Troy (about twice as much), but the production of both cities continued to grow. In 1895 Buffalo produced more beer than Albany and Troy combined, and Rochester produced almost as much as the two cities. Prior to prohibition, Buffalo was producing 1 million barrels a year. That was a third more than Albany, Troy, Hudson, Schenectady and all the breweries in the Hudson Valley Brewers Association combined. Locally, brewery production was essentially flat from about 1885 up to prohibition. In terms of stability, Albany had a core of brewers working at close to the minimum efficient scale (close to the MES, but not at or over) and Troy had a couple. So, what was happening in Buffalo and Rochester was a microcosm of what was happening across the country, which was somewhat volatile and changing. 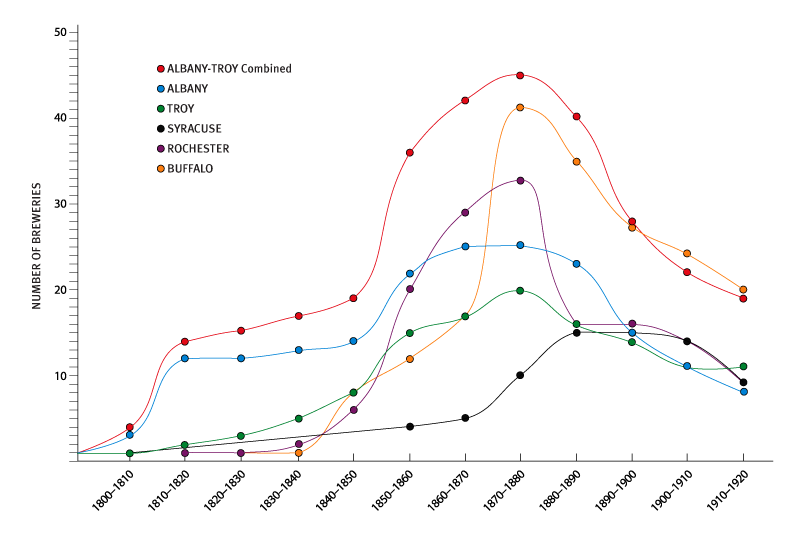 Albany and Troy didn’t have the big spikes because the breweries in the region, at least in the latter part of the century, brewed primarily for local consumption, which led to more stable production numbers and more stable brewery numbers. The same was largely true for Syracuse. But clearly all the talk of regional consolidation for Hudson valley breweries, started in the 1880s, was really about scale and efficiency.  Consolidation never happened for many reasons, and I think the stability in the local brewing landscape was one of them (that and control of operations, of course). Anyway, an interesting blog and the graph provides a good visual of the situation in the region compared with the rest of Upstate New York. Wouldn't "a lot of brewery starts, and also a large number brewery stops as new (and old) businesses realized they couldn’t compete." constitute a bubble—or at the very least a boom and bust scenario? Isn't that exactly what happened during the late 1990s dot com bubble? That’s an interesting question. You’re right that there was boom and bust for breweries; but in terms of beer production, there was just boom. As you point out, the changing fortunes of companies is the typical up and down of business and industry. Maybe I’m being too literal in thinking about your question: “Could there have been an unsustainable 19th century beer bubble—especially in western New York— during the 1870s, that popped in the 1890s?” Perhaps I’m placing too much emphasis on the "beer" part, but to my mind there wasn’t a market bubble for beer in the 1870s or 1890s. There was a lot of ferment in terms of who was in the game, but the market itself never burst. Nationally, beer production grew 450% between 1880 and 1915, and over 200% between 1890 and 1915. At the same time, the number of breweries continued to drop. I’m not an expert on the dot.com bust, but I don't think that it was the same kind of boom and bust scenario for the breweries as for the dot.coms. My sense is that a lot of dot.coms only got into the game in order to get out. The strategy wasn’t to be sustainable, but to get bought out and make a big pay day. As a result, market value was inflated and when the over-valued market burst everyone fell, not just those who couldn’t compete (or something like that -- as I said, I’m not a dot.com expert). I think that the people getting into the 19th-century brewery game thought that they could compete and stay in the game, be successful, and ride the growing tide of beer. The market kept going but a lot of individual companies couldn’t. Your post made me think about the current situation in the brewing world in which there are a lot of stops and starts and where small is often good but giganitic is often the name of the game. It would be interesting to look at the stats for current breweries and see how things stack up (or graph out) against the 19th-century situation. I suppose, the bubble may not have have been a beer bubble, but perhaps a brewery bubble. Again, not unlike the dot com bubble. The internet/tech sector began it's boom in the early 1990s, start-ups flooded the market and bubbled in the late 90s, and then busted early 00s. Regardless of the reasoning behind those start-ups getting into the market, there was still a bust. However, it didn't kill the market, or the product. The internet continued, as this blog is proof of. It's looking like something similar happened 120 or so years earlier in the brewing world. Breweries began their boom in the 1860s, bubbled in the 1870s and burst in the 1880s. That's not to say beer, or the demand for it burst—just like the internet—the burst came on the brewery side. Those open and close breweries in Rochester and Buffalo in the 1870s may have well been the Pets.com of the 1880s. What about the impact of immigration on all this? I believe - though I'm not sure if the data will back this up - that post-1848 there was a significant amount of European-to-America immigration, and that many of those immigrants came from places where beer was more popular (e.g., Ireland, Germany). If that is in fact the case, that could help explain the boom - i.e., immigrants who knew beer arrived in the USA in mass and gravitated towards a business (i.e., brewing) that they knew and created a product that they believed they could sell. I'm pretty sure that in the mid-19th century there was quite a bit of German immigration to WNY, while Albany saw plenty of Irish immigrants. Perhaps the quick increase in population, coming from beer-loving countries to a greater degree than in the past, led to that spike in the #s of breweries in upstate NY. Then, over time the market did what it does: ween out the "bad" breweries (on the basis of product quality, advertising practices, capital strength, random luck, etc.) and replace them with "better" breweries. Not as a boom-and-bust, speculative bubble-type thing, but just a response to the influx of beer-loving immigrants and the populations swell in general. . . .
My point is that just looking at the size of the "market" as reflected in the #s of breweries in these areas doesn't give much of a cause-and-effect picture. Crunching #s and looking at raw data is great, but we need some context - and I think immigration patterns may help provide some of that context. Of course immigration is important. Immigration is what ultimately put the "population" in the population boom. The western cities grew because the Erie Canal offered easy access to them, especially too immigrants arriving from Europe. But, the boom isn't what's in question. It's not the weening that's an issue either. It's the speed at which those breweries opened and the closed. 43 new breweries opened in Rochester and Buffalo from the mid 1850s to the mid 1870s. By that time, 74 breweries are operating in both cities—including breweries that had been operating before the boom. By the mid 1890s, 33 had closed. That's a 30% increase followed by a 45% loss in less than 50 years. Immigrants, or puppies—regardless of cause—that's a boom/bust situation. What I wonder is, could Albany's already successful brewing industry have spurned speculation that other cities further done the canal—populated increasingly by immigrants or not—could also have had Albany Ale-like success in brewing, as well? "What I wonder is, could Albany's already successful brewing industry have spurned speculation that other cities further [down] the canal—populated increasingly by immigrants or not—could also have had Albany Ale-like success in brewing, as well?" I suspect it may have played a role. 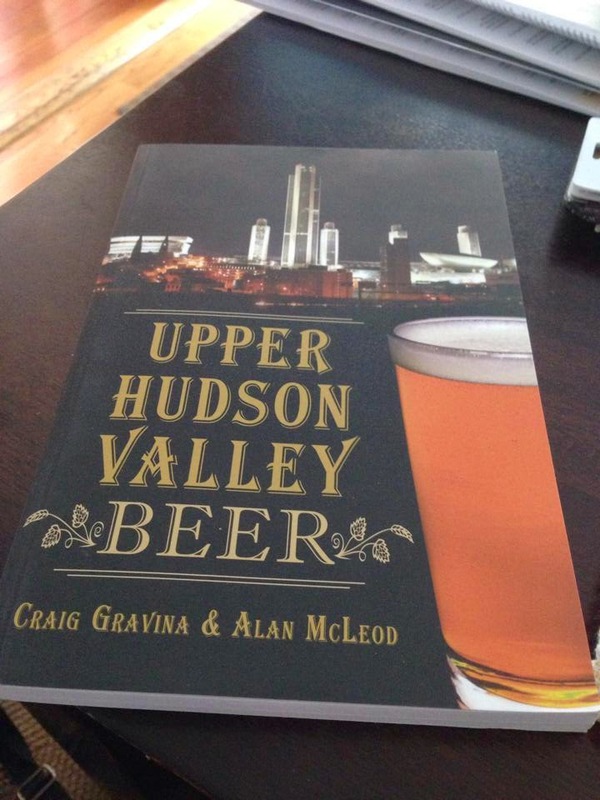 After all, it's not unreasonable to think that potential brewers who saw the Albany success story would think, "Heck, I can do that in [insert WNY or CNY City here]." But I don't think the data you cite to can shed any light on the motivation of these new brewers - or, in fact, their knowledge of the success story in Albany. . . . It's all just speculation at this point. "It's all just speculation at this point." Isn't that where the answers to all great questions start? What about better transportation? 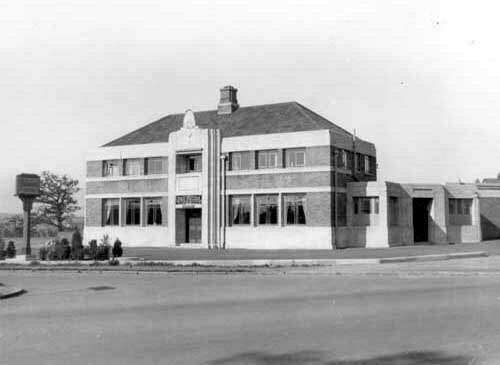 A lot of breweries would have been little more than pub breweries with maybe a few other outlets in the neighbourhood. As transportation improves there is more competition and the less efficient breweries producing crapier beer would be more likely to fail.